Return and Earn with Vinnies! Vinnies is a Return and Earn collection partner for eligible containers, providing more than a dozen over-the-counter deposit points in Vinnies Shops throughout Western Sydney, the Illawarra and Shoalhaven, as well as bulk processing sites in Unanderra, South Nowra, Penrith, Cardiff and Wagga. These sites are soon to be complemented by an expanding network of bulk container deposit facilities managed by Vinnies across the state – stay tuned! The NSW State Government launched the Return and Earn Container Deposit Scheme (CDS) in late 2017 in an effort to address drink container litter, which makes up 44% of the volume of all litter in the state. Our participation in the scheme expands on the Vinnies ethos and ongoing commitment to recycling, and is an extension of our retail store philosophy of reuse – helping to divert waste from landfill and supporting those in need at the same time. As at March 2019, Vinnies had processed more than 20 million containers, helping to divert in excess of 77,000 cubic metres of recyclable waste from landfill – that’s around 835 semi-trailer loads! The program provides Vinnies with an additional revenue stream to help fund its Good Works within communities across NSW, receiving a handling fee for every container processed. Customers can also elect to donate their container refund to Vinnies in support of our fundraising efforts, with all donations over $2 being tax deductible. Businesses and organisations interested in exploring partnership options can contact Vinnies NSW CDS project manager Jon D’Astoli on 0427 952 730 or via email to learn more about working together with Vinnies to create a socially and environmentally sustainable future. A fifth Vinnies-operated bulk container deposit centre was opened in the heart of the Riverina on 8 April, providing a fast, drive-through alternative for community members and businesses to claim the 10-cent refund for eligible containers as part of the State Government’s container deposit scheme. 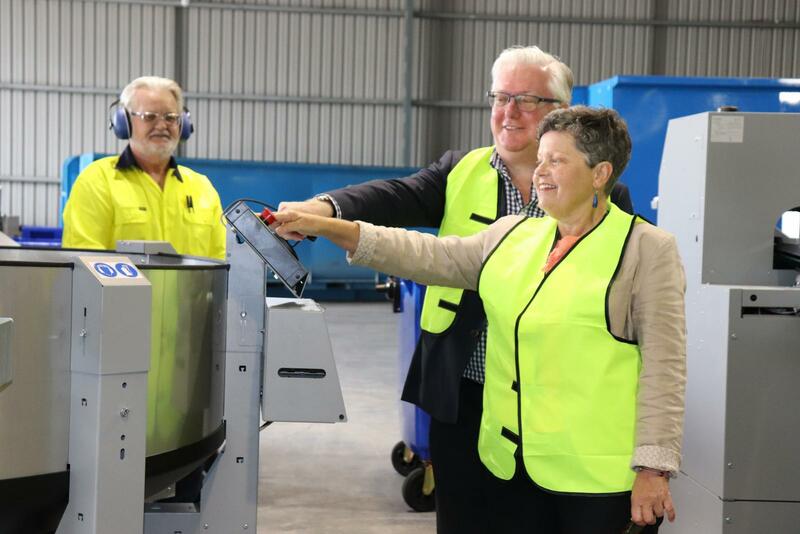 The new facility, located at 90-92 Hammond Avenue, East Wagga Wagga, is open from 8.30am to 3.30pm, Monday to Saturday, and processed more than 220,500 containers during its first week of operation – a strong reflection of how locals have embraced the Return and Earn scheme. With the opening of the Wagga facility, Vinnies now has 20 return points operating across NSW to facilitate 10-cent refunds for Return and Earn customers, and the handling fee proceeds received by Vinnies from scheme operators Tomra Cleanaway help to support the important work of the charity within local communities. Visitors can also choose to donate some or all of their refund to make an even greater impact, with tax deductible receipts issued for donations of $2 or more. In just over a year, the Vinnies NSW Container Deposit Scheme initiative has seen more than 20 million containers processed through Vinnies shops and bulk container deposit centres as part of the Return and Earn program, helping divert in excess of 77,000 cubic metres of recyclable waste from landfill – that’s around 835 semi-trailer loads! Since opening the first over-the-counter container return points in December 2017 at more than a dozen Vinnies shops across Western Sydney, the Illawarra, Southern Highlands and Shoalhaven, the Vinnies NSW Container Deposit Scheme has grown to boast dedicated bulk deposit sites in Unanderra, South Nowra, Cardiff and Penrith – with a fifth due to open in Wagga Wagga later this month. While Vinnies customers enjoy convenient access and 10 cent Return and Earn refunds, the handling fee proceeds received by Vinnies from scheme operators Tomra Cleanaway help to support the important work of the charity within local communities. Any container donations allow Vinnies to claim the 10 cent refund on behalf of the donor, and over 460,000 containers donated during 2018 resulted in more than $46,000 in additional revenue through participation in the scheme. Customers can also opt to donate some or all of their on-the-spot refund in support of Vinnies services. “While our participation in the container deposit scheme is intrinsically linked to the Society’s ongoing commitment to recycling, and is an extension of our retail store philosophy of reuse, together with local individuals, communities, businesses and schools who choose to Return and Earn with Vinnies, we’re helping to educate the general public and divert waste from landfill while supporting those in need at the same time,” said Vinnies Container Deposit Scheme project lead, Peter Quarmby. Stuart Ayres MP Member for Penrith recently joined representatives from St Vincent de Paul Society NSW and Tomra Cleanaway to celebrate a Return and Earn milestone, with more than 10 million containers having now been collected through Vinnies’ return points. 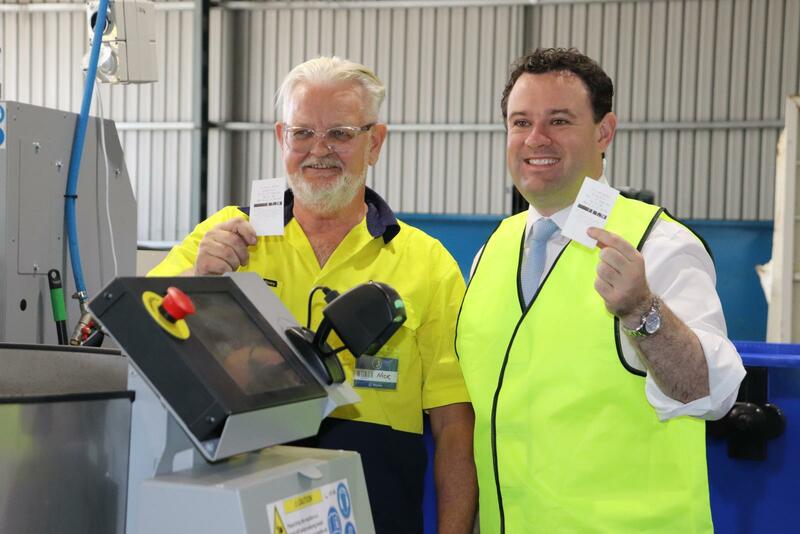 Stuart Ayres congratulated us on this milestone at the newly opened Penrith automated depot site, which is one of four automated depots and 15 over the counter return point sites operated by Vinnies as part of the NSW container deposit scheme. “Vinnies is a great example of the success of Return and Earn, with 19 return points operating across NSW to facilitate 10 cent refunds for customers and to help support the important work that the charity does in our communities,” Stuart Ayres said. 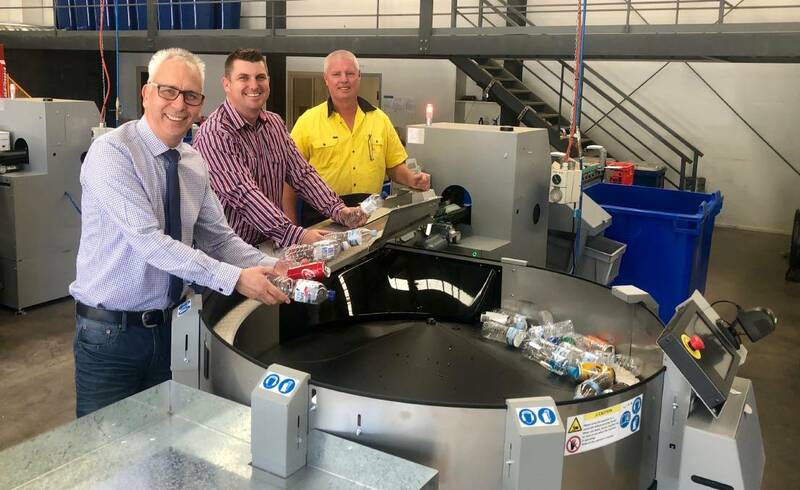 A fourth Bulk Container Deposit Centre has now opened in Penrith, providing a fast, drive-through alternative for community members and businesses to claim the 10-cent refund for eligible containers as part of the State Government’s container deposit scheme. Located at Unit 3, 137 Coreen Avenue, Penrith, the new facility is open from 8.30am to 3.30pm Monday to Saturday and has the capacity to process up to 100,000 containers per day. Boasting drive-through access as well as automated sorting and counting, the facility presents an efficient way to process large volumes, helping residents, schools, community organisations and businesses alike to take advantage of the Return and Earn scheme. Vinnies NSW Container Deposit Scheme Project Lead and Executive Officer for the Vinnies Parramatta Central Council, Peter Quarmby, hoped the facility would be embraced by the local community as a convenient Return and Earn option. “For almost 100 years our retail outlets have been the public face of the Vinnies commitment to reuse and recycling, and participation in this new initiative is a natural extension of our core philosophy – diverting waste from landfill and helping those in need at the same time,” he said. More than 11 million containers have been processed through the Return and Earn program in the Penrith area alone, with more than 856 million containers collected at return points across NSW since the scheme began in December 2017. 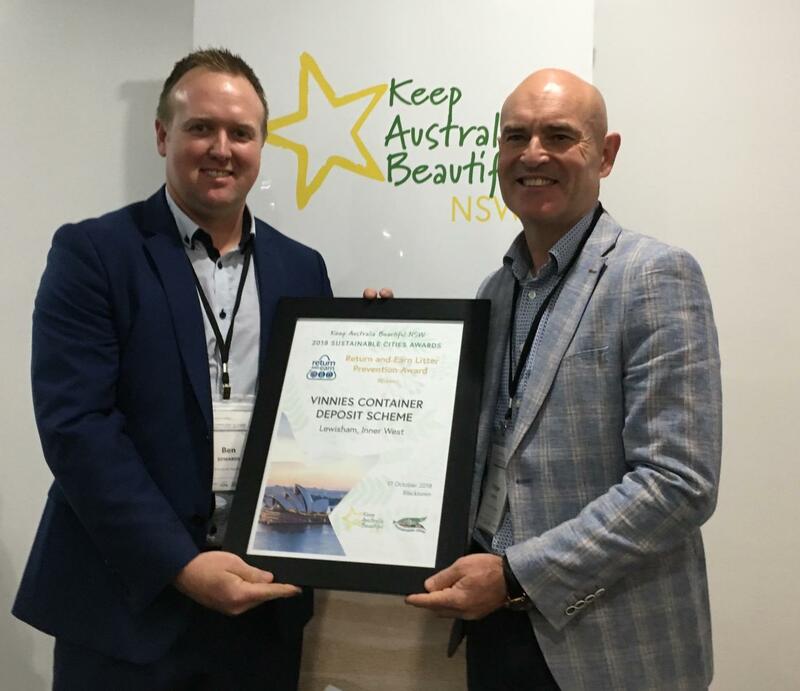 The Vinnies NSW Container Deposit Scheme has been awarded the inaugural Keep Australia Beautiful NSW Return and Earn Litter Prevention Award, recognising the positive social and environmental impacts Vinnies is achieving through participation in the scheme. 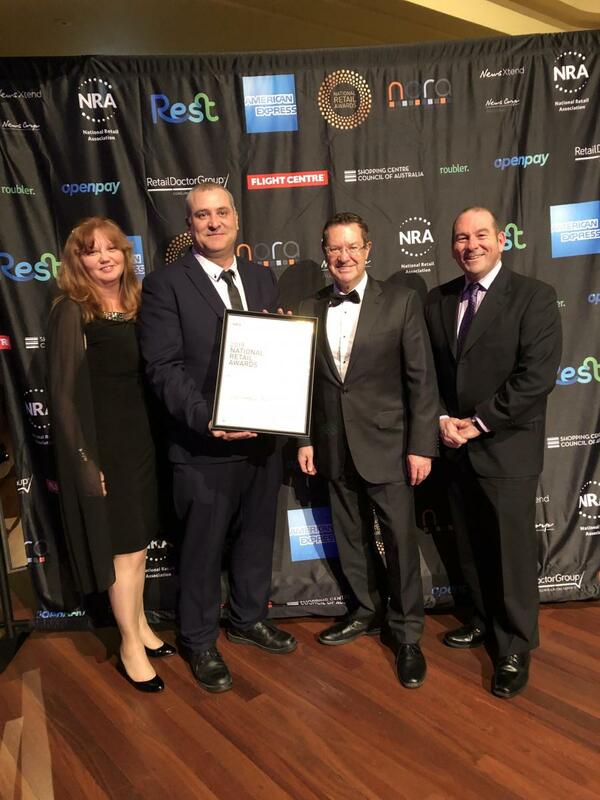 This accolade is the second major award for the Vinnies NSW CDS initiative and acknowledges the commitment of the organisation to expanding on our retail store philosophy of reuse by helping to divert waste from landfill and supporting those in need at the same time. Special thanks to everyone who has chosen Vinnies as the deposit point for their eligible containers, helping to divert more than eight million containers from landfill to date! On Monday 17 September, Vinnies opened a new Bulk Container Deposit Centre in Cardiff (Lake Macquarie), with operation of the site helping to generate additional funds in support of Vinnies services for people experiencing homelessness and disadvantage across the region. The centre presents an efficient way to process large volumes of eligible containers, helping residents, schools, community organisations and businesses to be a part of the State Government’s Return and Earn container deposit scheme. The new facility, located at 1/12 Belford Place, Cardiff, is the third of its kind to be operated by Vinnies in NSW. With the capacity to process approximately 100,000 containers per day, it complements existing over-the-counter sites and reverse vending machines across Newcastle and Lake Macquarie. Boasting fast processing and convenient drive-through access, the facility is open from 8.30am to 3.30pm Monday to Saturday. Container deposit refunds can be received on-the-spot via reverse electronic funds transfer (EFT). Facility users can choose to donate some or all of their refund to Vinnies to help support vital services, with tax-deductible receipts issued for donations over $2. Vinnies Executive Director for Central Councils and Commercial Operations, Peter Knock, said that the Cardiff facility expanded on the Society’s ethos. “Our participation in the container deposit scheme is intrinsically linked to the Society’s ongoing commitment to recycling, and is an extension of our retail store philosophy of reuse – helping to divert waste from landfill and supporting those in need at the same time,” he said. Vinnies NSW has been named Social Responsibility Champion at the 2018 National Retail Awards for our involvement in the Return and Earn program! Participation in the container deposit scheme through over-the-counter and bulk collection points provides Vinnies with an additional revenue stream to help us provide the services we offer, contributes towards positive environmental outcomes, fosters community spirit, and supports fundraising efforts of both the Society and other community partners. The national accolade is a testament to the many volunteers, staff and community members who have embraced our involvement in the program, and acknowledges the organisation’s ongoing commitment to recycling in an effort to reduce environmental impact. In April 2018, Vinnies NSW launched a new Bulk Container Deposit Centre as part of the state’s container deposit scheme – the second of its kind to be operated by Vinnies in NSW. With the capacity to process approximately 100,000 containers per day, the new bulk processing facility located at 10-12 Investigator Drive, Unanderra complements existing over-the-counter sites and reverse vending machines with an efficient way to process large volumes of eligible containers. The facility is open 8am - 3.30pm Monday to Saturday, with both the general public and businesses able to take advantage of fast processing and convenient drive-through access. Vinnies first bulk container processing centre at 11/158 Princes Highway, South Nowra is also open and ready to process containers Monday to Saturday, 8am - 3pm. Individuals and organisations can bring their bulk amounts of eligible containers to the Vinnies processing centres and either receive the refund directly through on-the-spot reverse Electronic Funds Transfer (EFT) or donate the refund to Vinnies. Tax deductible receipts will be issued for donations over $2.